The SAMBA’s wide range of products means it offers a flexible vending experience to satisfy all tastes. 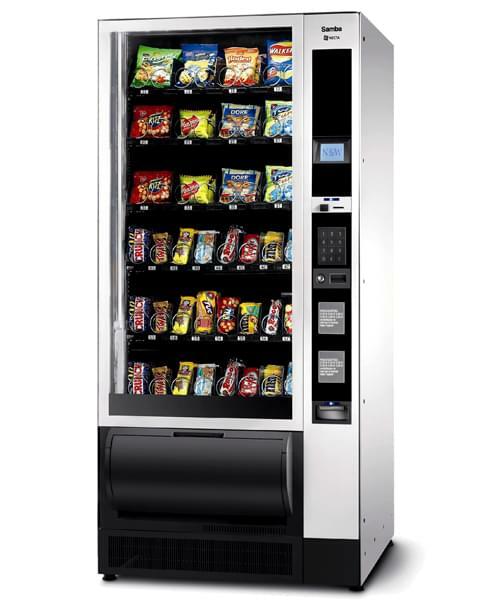 Staff in office and factory environments often like to enjoy the benefits of a coin operated snack, can or hot drink vending machine and thanks to both lease options and free install options there are many opportunities for employers to offer this service to their staff. The SAMBA’s wide range of products means it offers a flexible vending experience to satisfy all tastes. The Samba Snack Vending Machine can hold up to 466 products over 36 different selections and 6 shelves. The stylish design and contemporary layout includes an LED lit glass front panel with high tech double glazed glass for security and aluminium side panels. Call us now on 0800 085 0065 for further information on our operated vending options and versatile cover plans.